About BioKinetics Research and Development from Pro Video Scout on Vimeo. 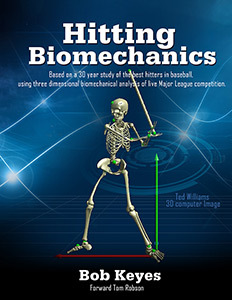 Purchase the new Hitting Biomechanics book here! Since the beginning of organized baseball there has been a great deal of material written on the extremely difficult skill of hitting a baseball. Hall of Fame players and former Major League hitting coaches have produced much of this literature, sharing decades of experience from the baseball “trenches” with those who aspire to follow in their profession. However, despite the thousands of publications written over the last hundred years, little information is available on the correct and essential body mechanics required to achieve success at the highest levels of baseball. Biomechanics is the science of measuring and describing human body movement. The purpose of this book is to define the “art” of hitting a baseball using knowledge gained from the science of biomechanical analysis. In 1986 Bio Kinetics Research & Development began conducting biomechanical research to better understand the body mechanics of the best hitters in the game of baseball, captured during live Major League competition. This book addresses the results of those three dimensional analyses that Bio Kinetics performed on hundreds of Major League hitters over the course of three decades. It is important to note that the information presented is NOT based on any past or present hitting theories or a simple two dimensional observation (such as with video or still images), as is the case with almost all prior publications. To the best of our knowledge, the scope and depth of this work is unique, and no other organization currently has both the process and the expertise employed by Bio Kinetics Research & Development. So, how have we accomplished this? The process starts with data capture. Multiple synchronized high speed and high resolution video cameras are used to record hitters in actual game situations. Next, the multiple two dimensional motion sequences are digitized and converted into a single computerized three dimensional motion sequence. Finally, the laws of physics, along with knowledge of exercise physiology and motor learning, are applied to yield an in-depth understanding of the essential patterns of movement, balance and muscular exertion required to successfully hit a major league pitch. It is the science of biomechanics, not simple observation that provides the irrefutable data presented in this book. However, this book is not a research publication but rather the author’s common-sense view of the information collected over the last 30 years, in addition to his own personal experiences working with professional and amateur hitters during this same time period. Under the title of “Pitch Out” various detailed experiences of this 30 year venture are told in each section. The author is well aware of the various “schools of thought” on the correct understanding of hitting mechanics, each with its attending army of vocal proponents and equally vocal opponents! The intention of this publication is neither to praise nor attack prevailing hitting theory, nor to discount anyone’s contribution to the science of hitting. It is important to remember that the evolution of knowledge and understanding of the baseball swing began more than one hundred years ago and many have made positive contributions along the way. Our research, and this book are simply the next step on the path. Three dimensional motion analyses, captured from live competition and compiled over three decades, provides solid evidence of what REALLY happens in the baseball swing, while exposing a tremendous amount of misinformation about the mechanics of hitting as well. This book separates fact from fiction and style from absolute efficient mechanics by presenting cutting edge objective information from those analyses. While the focus of this book is what the best hitters in baseball do, biomechanically, it is important to point out that hitting a baseball is more than simply a mechanical skill. Although often affected by mechanics, the mental, perceptual, and reactional components of this skill are discussed in chapters 9, 10 &11.